This presentation draws on a range of organisational and practice-based theories to understand organising for emergency incidents. Fire and emergency service work is becoming increasingly important as the impact of climate change results in more extreme weather events that need to be managed in terms of their effects on communities. 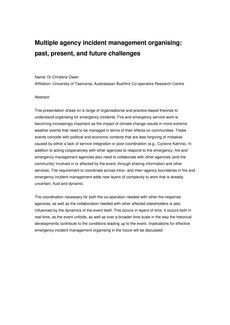 These events coincide with political and economic contexts that are less forgiving of mistakes caused by either a lack of service integration or poor coordination (e.g., Cyclone Katrina). In addition to acting cooperatively with other agencies to respond to the emergency, fire and emergency management agencies also need to collaborate with other agencies (and the community) involved in or affected by the event, through sharing information and other services. The requirement to coordinate across intra– and inter–agency boundaries in fire and emergency incident management adds new layers of complexity to work that is already uncertain, fluid and dynamic. The coordination necessary for both the co-operation needed with other fire-response agencies, as well as the collaboration needed with other affected stakeholders is also influenced by the dynamics of the event itself. This occurs in layers of time. It occurs both in real-time, as the event unfolds, as well as over a broader time scale in the way the historical developments contribute to the conditions leading up to the event. Implications for effective emergency incident management organising in the future will be discussed.